Swim Bike Run: My new bike - she needs a name! My new bike - she needs a name! Hey - Look at my new toy! I took my new bike out for a spin today - which considering it is FEBRUARY 9 in Toronto - that alone is a wonderful thing. 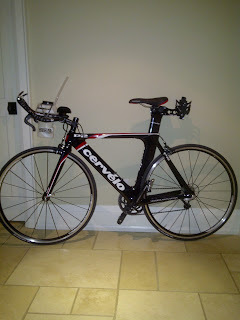 But it was special to take my very first tri-bike out for a spin the day after I got it. It wasn't all smooth riding though - I actually had a panic attack getting on the darn thing! I'm not kidding - it's been 5 months since I have clipped into a bike (not counting time on a trainer of course). That coupled with the fact that I am dealing with a damaged tib/fib joint in my left knee which we can only assume is the product of my 3 falls on my road bike this past summer. All that on top of it being my extremely new, expensive, shinny tri bike. Yip, it took me a good 10 minutes to talk myself onto that bike! CRAZY! road bike and completely know why aero position is not welcome in group rides. I have a lot of learning to do that is for sure. But I am so very pleased with my new bike! Thanks to the hubby who is so wonderfully supporting my Ironman year! I'm back and I'm Ready!